View of “Jerry Blackman: Undone Yin Yang,” 2017. A nonlinear notion of time—where past and future coincide, cycling in an eternal return—is represented by Jerry Blackman’s forever-unfinished artworks here. 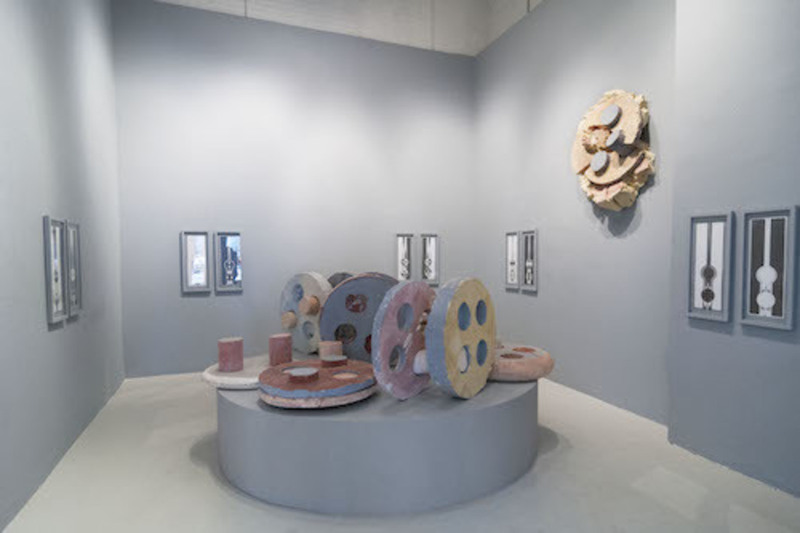 Huddled in the middle of the space, archaic-looking disks in gray, blue, and cream indicate a turn toward the past (all works untitled and 2017). These process-based, freestanding sculptures, created with equal parts water and plaster dust, seem prepared to roll away at any moment—a pair of them jump out from the gallery’s walls. The show feels like a dusty, crumbling excavation site. A round, smoky platform grounds the rest of the pieces in the room, establishing a kind of order and solidity for the jutting, impermanent structures. Hung on the surrounding walls in five sets of two are sleek graphite drawings that evoke the smooth perfection of a utopian future. Reminiscent of Sol LeWitt’s A sphere lit from the top, four sides, and all their combinations, 2004, the drawings indistinctly separate the darkness of yin from the light of yang, proving that one cannot appear without the other. Set in bleak frames that match the walls, the diptychs, symmetrical and modern, also appear strangely antiquated. Time operates on numerous registers in Blackman’s immersive tableau, seducing and confusing the viewer. The tension he creates settles on a temporal area where the only possible moment of recognition is now.